All set? OK! 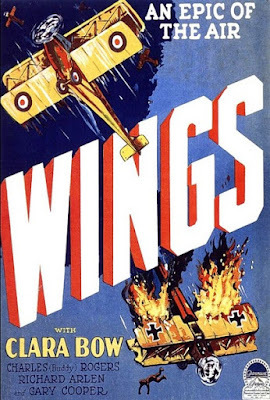 On this episode we take flight with the first film to win the Academy Award for Best Picture, William Wellman's aerial war epic Wings from 1927. We discuss the amazing stunt work and how the film set the template for decades of war movies. Meanwhile, Tim offends the Fatherland with his bad German accent and Corinne illustrates the importance of good coffee to the movie-watching experience. Warning: Contains explicit language, spoilers, and bubbles, bubbles everywhere! Do you think Gary Cooper was picking his nose in that scene? Have you ever eaten a cursed Hershey's bar? Trying to find the best source of bubbles? Leave a comment below and keep the conversation going.